Juliette has escaped to Omega Point—the headquarters of the rebel resistance. There she discovers other people with abilities. Abilities they have learned to control. And for the first time in her life, Juliette has hope. Hope that she can have a life with Adam. Hope that her touch can be used to save instead of destroy. But Juliette is only just beginning to understand the depth of her power, and she’s struggling to fight the desire to use it. She’s still haunted by her past, terrified by her future, and tormented by Warner, who still wants Juliette more than she ever thought possible. I absolutely adored reading Shatter Me last year. It was one of my most favorite books of the year! 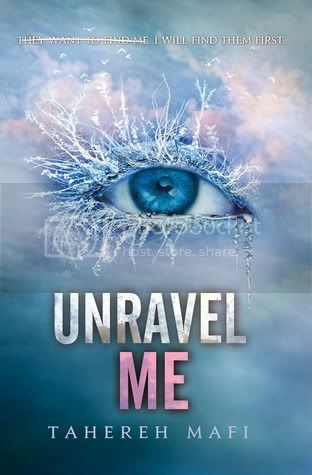 I can't wait to get my hands on Unravel Me. I love Juliette and Adam! Oh I love those new covers *sigh* and I loved the first book so freaking much! Cant't wait for this either! YES YES YES! Eeeep! I'm also DYING to read this! I only just read Shatter Me quite recently but I adored it! I'm ashamed to say that I still haven't read Shatter Me! *hides* But I really plan to! Just saw this at another blog! Sounds cool! The first book was amazing and I love the new covers. I didn't even notice that the synopsis was posted! Eeeek! Things are not sounding good for poor Juliette. Amazing choice! Can't wait to get my hands on a copy either. Oh, yes ma'am! I'm on pins and needles for this one, especially since the cover re-design. No more girl in the dress--a beautiful/creepy eye instead! Nice pick. I really loved Shatter Me too! It was so good, and I can't wait for Unravel Me! Looking forward to more Adam, Juliette and Warner. I'm so excited for Unravel Me! I'm curious to see what will happen next with Juliette. Yees! I am dying to read this one after the amazing Shatter Me! And I'm in love with these new covers! YES I need this one for sure!